20/20 Imaging is bringing 20/20 vision to your practice. Our new DR technology is a giant leap forward, bringing the future of digital imaging to your doorstep. 20/20 Imaging was the first to introduce digital imaging to podiatry, fully automatic dedicated extremity CR, and the very first to introduce dedicated DR to podiatry. Now 20/20 Imaging introduces this DR Technology to the upper extremity profession! 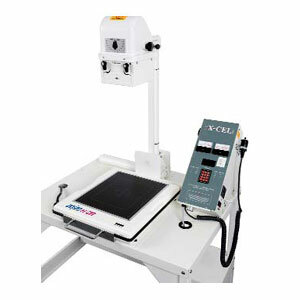 The H-DR 101 dedicated hand imaging system adds to exam efficiency. Couple that with our unique CCD sensor design that allows for a 22-48% larger imaging surface than current analog (film) or computed radiography (CR) processing. The H-DR sensor directly captures the image data and displays it on a monitor within 10-12 seconds. Alternatively, the sensor can be installed as a retrofit with most existing x-ray configurations. Experience the enormous clinical and business benefits of direct radiography to your orthopaedic practice with the revolutionary H-DR 101. Finally, small steps in technology deliver a giant leap in patient care. The H-DR 101… simple as 1-2-3.